The Life of Bon: The Evils of Lemonade Stands. This is real stuff. The Evils of Lemonade Stands. This is real stuff. The weather was 70+ degrees, the birds were singing, the skies were bluing, be ye certain, the day was GOI-GEOUS! After a great day at high school, I drove home today with the windows down, the sunglasses on, sipping on a little diet coke and chilling out to Norah Jones. It was a wonderful drive, and even when I got stuck in traffic (Curse you, I-15!) for half an hour, I hardly even minded. I just let that sun come in those car windows and share its warmth. Yes, I was feeling great. That's what 70+ degree weather does, you know? See how happy I look in this picture? That is how I was feeling on the way home. (And on a complete side note, this is a tandem bicycle ride in Newport Beach with my old roomie, Kristen. Nearing home, I noticed a bunch of young 'uns selling lemonade. And by golly, I was in such a good mood that I thought, "Why not? An ice cold glass of lemoande sounds delicious and those little tikes will be so grateful for my biz-ness!" I slowed to a stop, "How much is the lemonade?" The girl holding the sign looked at me blankly and shrugged her shoulders. Alright, little girl, let me tell you something if you want to make it in the business world. You might want to know the price of the product you're trying to sell. I'm just saying. It couldn't hurt. So I asked again, "How much is the lemonade?" A boy standing nearby seemed a little more clued in than his female cohort. "It's 50 cents!" he yelled across the street. FIFTY CENTS? For a dinky cup of gross lemonade? Who are we trying to kid around here? Had it been anyone else in the world besides a bunch of little kids I would have simply muttered "Too rich for my blood" and sped off. But those kids looked at me, their lips puckered, their lemoande already poured, and I just couldn't say no. Not even I am cheap enough to deny these innocent creatures their sale. So I forked over the two quarters. The girl ran out with a small glass of lemonade for me. When I saw the size of the cup it was all I could do to not yell "You call this a cup? Well I call this highway robbery, toots!" The cup, a full 6 ounces if you want to know, was only half full. I did the quick math. I had paid $.50 for 3 ounces of lemonade. I told you it was highway robbery. Bunch of crooks, every last one of them. I put the car into drive and got out of there before I did some serious harm to those thieving munchkins. At the stoplight I took a sip. Now, I'm not one to normally go around complaining about lemonade, but this was 99% water and 1% lemonade mix. Ah, those kids had got me again. AND it was warm. I don't think there are many things in this world more disgusting than warm watery lemonade. If you think of one, by all means, let me know. I realized. Those kids were totally taking advantage of me. The had done the exact same thing that buxom blondes do when they want favors from men. They use who they are to get it. (And while we're on the subject, isn't buxom the coolest word ever?!) The same thing that celebrities do to get their way. They use who they are. The same thing that athletes and rich kids do at my school to win over teachers. They use who they are. Those dirty rotten kids had just played me like a fool! They had no quality product to sell, but rather, they used who they are (namely, children) as an advantage to get me to buy it from them. Had it been an adult selling the lemonade, I never would have even thought about buying it. But, no, those kids had got the best of me. Pulled the covers over my eyes and ripped me off! Used their youth, their "innocence," their cuteness to persuade me to buy something I completely didn't want. And that is just wrong. I'm sorry, but I just can't continue to support these lemonade stands just because they are run by children. These children will turn into monsters who are used to always getting their way, inspite of not having anything of value to offer. I must stop the evils of lemonade stands now before it is forever too late! Haha my future children will sell lemonade at a stand as punishment! i always seem to get suckered in by the lemonade stands too! i end up spending more money trying to get the taste out of my mouth but they just get so freaking excited! thats really funny, not that you got ripped off but bc on our walk home from school there was a little girl that told us she had lemonade, so we walked to the house, grabbed some change and came back paid her and she was like i have water bottles. what the heck, she was nice and i told her to put on sunscreen, but the audacity of that girl. jk jk. but i really wish it was lemonade instead of water. I came across a little girl selling rocks that she had colored on and bedazzled. I don't know why I couldn't say no...darn adorable kids. This is the funniest thing I have read all day! Haha! Those darn kids get me every time too! ok, seriously? this is why i refuse to ever buy anything from a lemonade stand & my husband always thinks i'm being rude! I take it Santa's sled is broken and your giving him a lift? Hahahaha, you're hysterical. I had the occasional lemonade stand back in the day, but I assure you, I only sold quality, ice-cold lemonade. Yes, I charged 50 cents a glass, but more than 3 oz of product. this is terrible. i would be pissed. i bought some cookies from some girl scouts a few weeks ago... walked up, and i had to be the first one to say hello... ummm business 101... GREET your customers. i realize that everyone is addicted to your cookies and you don't even have to try to sell them... but those kids didn't even have manners! their mothers should be ashamed. 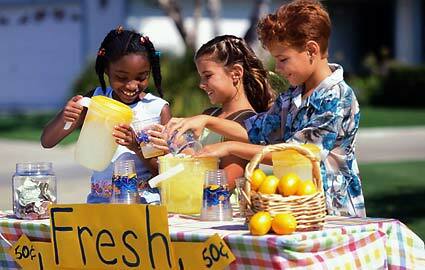 I was the kind of child who sold lemonade with my friends like...every weekend...literally. So whenever I see this, I always stop. However, in my defense, our lemonade was always 1) cold 2) really good. Plus, I was a cute little girl. So that always help. In conclusion, I understand why you're pissed. Haha. How old were they? I am sure being a little kid I wouldn't know I was ripping anyone off. I remember selling rocks (which I picked from my neighbors yards) back to them for a few dimes because my friend and I thought it would be awesome to buy some icecream from the icecream man. But then again, kids do have the upper hand looking all cute and I am sure some use it to their advantage. Hmmm...I feel an integral part of Americana living has been left out in my existence. I don't think I have EVER seen a single lemonade stand in my life. You feel robbed, but now I feel jipped. I want the chance to fume and shake my finger at those mini-scam artists, darn it! Haha, OMG, I'm really glad I followed your blog. You are so funny!